I moved into my home in Hemel Hempstead with my husband and son on the 26th July 1955, and why do I remember the date so vividly, well it was my first home, as we had been living with my in-laws previously. The second reason was that when we moved into Long Chaulden the cement mixer was still being used in our back garden, and even though it was very noisy at times, we did not care as we were in our own home and that meant everything to us. The third reason being the last but not the least, was that the Bream Bus Company started running a new route up Long Chaulden, stopping right outside of my house, which, not having a car was very handy indeed, as I could get straight in the bus without having a long walk ahead of me, and either get out at the Warners End shops or continue into Hemel Hempstead town centre and do more shopping, which was very useful to me as I was working at Apsley Mills at the time, and every moment counted when you had a family and a home to run. I cannot remember every detail about the shops in Chaulden, as we used to have butchers, and a grocers van coming round at certain days of the week. However, I do believe that there was a paper shop, a sweet shop and a hairdressers salon in the beginning. Also if we walked down the hill to the bottom of Long Chaulden where the dentist now stands, there was a small shop which was run by a gentlemen called Mr Green who sold practically everything you needed, and because it was not a self service one, we all used to stand in a queue and have a good old chatter. There was also a hardware shop where you could buy your kitchen utensils, buckets and sweeping brushes etc. They sold oil as well, as many of us used to use the oil stoves in our kitchens before central heating came into our lives. We continued going down there until the shops at Chaulden were completed. Even though we were Catholics, well, I was a convert actually, my son John went to the Chaulden School at first as we were waiting for the Blessed Cuthbert Mayne to be built. However, because of all the new children coming into the area, some of the classes were transferred down to Pixies Hill, and were taught in wooden huts there, and he stayed until Blessed Cuthbert Mayne was built, and was ready to accept the children. Also the same wooden huts were used as a clinic where we would take our babies to be weighed and have their injections, until it was transferred to the Chaulden Community Centre. In the meantime I had left Apsley Mills for personal reasons, and had gone to work at the Reliance Rubber Company who manufactured moulded seamless hot water bottles, but all I did was inspect eye and ear droppers which was so boring that I left soon afterwards, and also I was expecting my second child a little girl, who was born in St Paul’s Maternity wing. I enjoyed it while I was in there, some people complained about the food, but I was quite contented having my meals cooked for me and waited on for a change. By 1961 after having four children in all, two boys and two girls, the town and surrounding areas where developing really well. I often took my children down to the canal, and there used to be a little tint shop right on the corner of the Fishery Inn Public House, were we would purchase fishing nets and confectionery items. We would then go down just below the shop onto the canal towpath and dead opposite the Public House was a small natural pool of water, where my children could fish for hours catching the tadpoles and the small fish that swam in this little pool, and there was a wooden seat where the adults could sit and watch. Alas the small shop was redeveloped and is now part of the Fishery Inn, and the pool is now overgrown with weeds and litter. When I look back now, I realise just how much I have seen of the redevelopment of Hemel Hempstead and the surrounding areas. 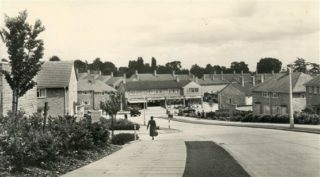 Warners End and the Chaulden shops being finished and especially the town. Woolworth’s moving from the Old High Street into the Marlowes where it still is today. My going to see a film with my family at the Princess or the Luxor Cinemas, and also having a meal at the Wagon and Horses Public House, all of which have now been pulled down. The Market Place up the High Street being next to the Old Town Hall, and the new Magic Roundabout being developed, and the opening of the Marlowes Shopping Centre in 1990. 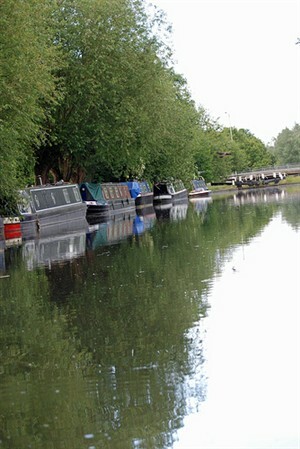 Writing all about Hemel Hempstead has brought a lot of memories back for me, but the one I remember the best, was when I used to walk along the canal on a Sunday afternoon, seeing the barges passing by the people walking along the towpath, and thinking to myself, what beautiful part of England I have come to live in, with the canal and countryside all around me, and the town centre just ten minutes walk away, what more could anyone wish for.